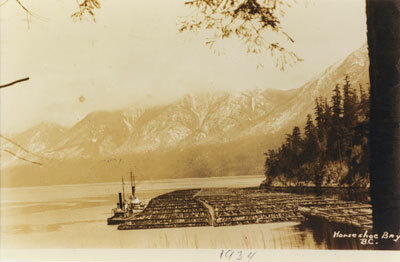 The image shows two tug boats with log booms in Horseshoe Bay in 1934. The photo is looking up Howe Sound with snow covered mountains in the background. Scanned August 2011 using Epson Perfection V700 Photo at 300dpi and 100% of original image size. Alternate Versions: Lossless TIF from original scan at 300dpi and 100% of original print. W25 x H16.5 cm sepia print on photo paper.